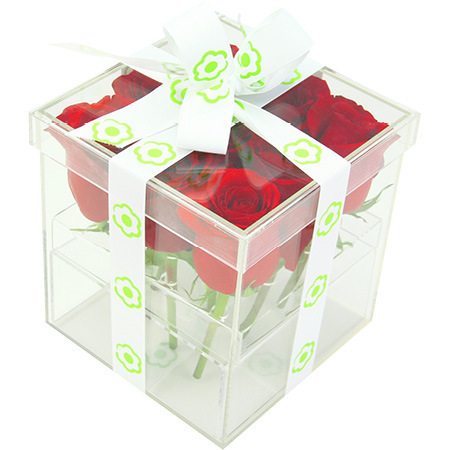 If you want to be a bit different this Valentine`s Day, why not send our contemporary perspex cube filled with 9 red roses? Delivered Sydney-wide, this fabulous alternative to traditional red roses for Valentine`s day is super popular and great value too! Our fresh red rose stems are cut to 8cm to sit upright in the clear cube, perfect for displaying on a bedside table or office desk. It also means you don`t have to worry about the recipient having an appropriate vase - beautiful, stylish and convenient. Please Note: Due to delivery volume on Valentine`s Day, no changes to orders can be made afer 18:00 AEST Thursday 7th February for Thursday 14th deliveries. It is also important to note we are unable to guarantee delivery times on Valentine`s Day - roses will be delivered anytime between 7 - 5.00pm (business addresses) and anytime between 7 - 7pm (residential addresses). No re-directs will be possible if the recipient has left the delivery address for the day, however we will try, where at all possible, to accommodate your needs if the situation does arise. We thank you in advance for your understanding!